Relative to the ground, the ball is traveling in a straight line at constant speed. So why does look like it is curving? Once air has been set in motion, you’d imagine that this air would continue moving in a straight line, right? But the Earth isn’t flat – it’s curved! Okay, so air would move in a line “as straight as possible”, following the curve of the Earth’s surface. shortest path, between two points, along the surface of a sphere. Yet when we watch a mass of air move, it always gets deflected, as if by some invisible force?! This invisible (fictitious) force is called the Coriolis force, after the French scientist Gaspard-Gustave Coriolis (1835) who first figured out what was really going on. Yes, the air masses do follow a great circle – but the land underneath them is rotating away – because the entire planet is rotating. So even though the air is going “as straight as possible”, us folks stuck to the Earth (everyone who isn’t on an overhead space station) see the air as if it is deflected away. In the inertial frame of reference (upper part of the picture), the black ball moves in a straight line. However, the observer (red dot) who is standing in the rotating/non-inertial frame of reference (lower part of the picture) sees the object as following a curved path due to the Coriolis and centrifugal forces present in this frame. A hockey puck is launched from the north pole. As it heads south, the earth turns to the east, causing the puck to appear to deflect to the west as viewed by an earthbound observer. A hockey puck is launched from London toward the west, on a stationary earth. The natural great circle motion of the puck takes it toward the equator, not along the original line of latitude, which we might normally call west. 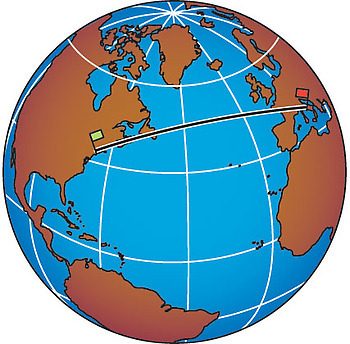 The great circle path also coincides with the line of sight toward the west (projected radially down to the earth’surface). Thus we must conclude that Costa Rica is due west of London. A hockey puck is launched from Vancouver toward the east. The inertial great circle path of the puck takes it south of the great circle path that the puck would follow on a stationary earth. The earthbound observer attributes this deflection to the centrifugal and Coriolis forces. Note that even the stationary earth path takes the puck south of the original line of latitude. Does water go down the drain in the opposite direction, on the other side of the equator? If the water was in a HUGE basin – miles across – and drained slowly? Then yes. But for most realistic cases? Toilets and sinks are so tiny, that the Coriolis effect is swamped out by random motions in the water. Two demonstrators sit at either end of a rotating platform and toss a ball back and forth. When viewed from the rest frame (when the camera is mounted to the ground), the ball follow a straight line but doesn’t reach its target because during the ball’s flight the target rotates away. When viewed from the rotating frame (when the camera is mounted to the rotating platform), the ball appears to experience a force that pulls it away from the target. This curved trajectory in the rotating frame is known as the “Coriolis Effect”, sometimes called the “Coriolis Force”, though it disappears in the rest frame. The Coriolis Effect can be seen in many situations where rotating frames are encountered, especially meteorology and astronomy. 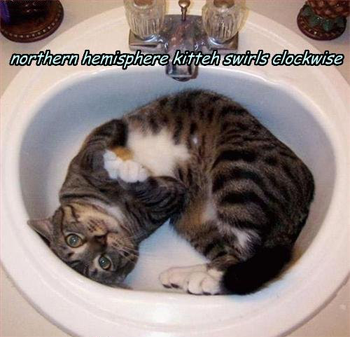 Atmospheric systems, for example, often follow circular patterns due to the Coriolis effect. Airplanes and missiles appear to follow curved trajectories when seen by observers on Earth as the planet rotates underneath. acted on by a net force. 1. Motion and Forces. Central Concept: Newton’s laws of motion and gravitation describe and predict the motion of most objects. 1.8 Describe conceptually the forces involved in circular motion. 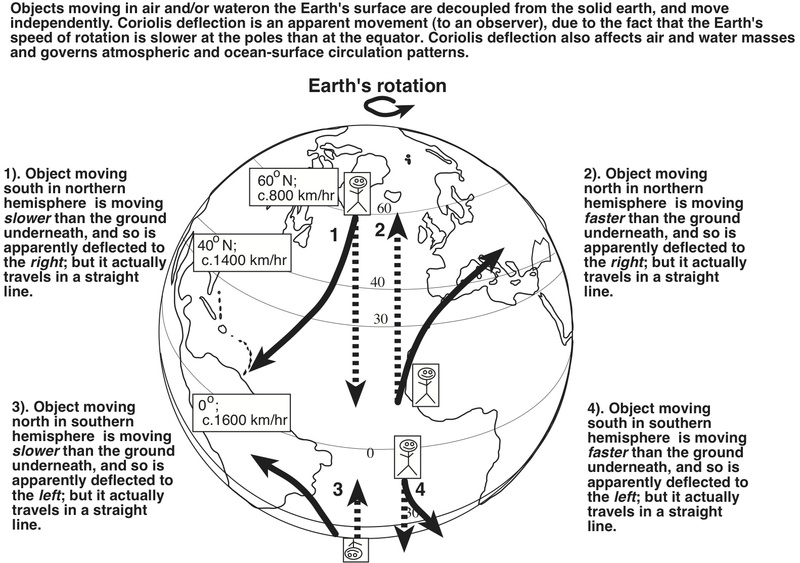 1.4 Provide examples of how the unequal heating of Earth and the Coriolis effect influence global circulation patterns, and show how they impact Massachusetts weather and climate (e.g., global winds, convection cells, land/sea breezes, mountain/valley breezes). Standard 4: Students will understand and apply scientific concepts, principles, and theories pertaining to the physical setting and living environment and recognize the historical development of ideas in science. 1.1e The Foucault pendulum and the Coriolis effect provide evidence of Earth’s rotation.